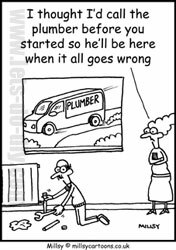 Summary: Learn how to install a cylinder rim lock. 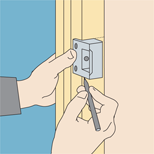 Position the latch at a convenient height and draw around it. Extend your lines around the edge of the door to the other side of the door. Measure the distance from the edge of the lock to the cylinder and mark the cylinder position on the front face of the door. 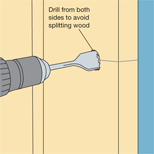 Drill a hole for the cylinder with an auger bit, drilling from both sides of the door towards the middle to prevent wood splitting. From the outside of the door, insert the cylinder into the hole so that it protrudes on the inside. On the inside of the door, attach the mounting plate. Saw the spindle down with a hacksaw to fit into the lock. Place the lock over the mounting plate and spindle, and secure with screws provided. Push the door closed, and mark the top and bottom of the latch onto the doorframe. The metal housing that receives the latch is called the staple. Position it on the doorframe in line with the latch markings, and draw around it. To recess the staple in the frame, use a chisel to chop out wood to the necessary depth. Screw the staple to the fame, and test the lock to make sure it fits squarely into the staple. Drill from both sides to prevent the wood splitting. 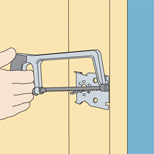 Position the staple on the doorframe in line with the latch markings, and draw around it.